Some of you want to track the total number of orders received from each customer. That way you can send special messages or special offers to your best customers. 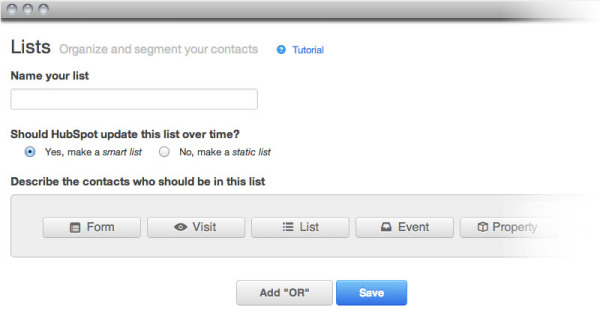 Log into HubSpot and go to Contacts -> Workflows. 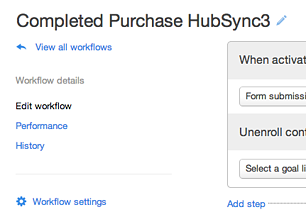 Click the Create new workflow button, and name the workflow "Completed Purchase HubSync3," or whatever you'd like. Setup the information to look like the example below. 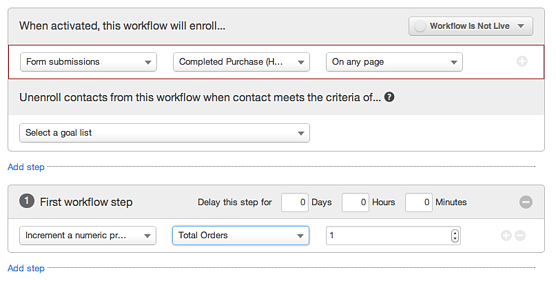 The workflow should trigger whenever the form named Completed Purchase (HubSync 3) is submitted. When this happens, the total number of orders gets increased by 1. You can add more workflow steps if you want. Remember you can only use each form once. Be sure to click the Save workflow button in the lower right. Also click the button to make the workflow live in the upper right. VERY IMPORTANT: In the side navigation, click Edit workflow. Then, in the next screen, make sure Any time one of the Starting Conditions occurs is selected. Finally, click Save. If you forget to do this step, it will only increment the orders once for each contact. That's it! Now the Total Orders will increment with each new order. I hope you like the changes. Leave a comment to let me know what you think! I am pleased to announce the release of HubSync 3! We are in the process of updating all our current clients. New customers will be setup on the new version from the start. HubSpot 3 was a major upgrade for HubSpot. Contacts, List, and Workflows all got major improvements. And, HubSpot completely re-worked their software APIs. The changes caused us to re-think how a shopping cart integration should work, and we hope you really like the new version. Know which sources are converting to sales. At a high level, it still works like it did before. We monitor your shopping cart to detect when visitors are adding items to their shopping carts and when they complete a purchase. Abandonded Cart - The visitor added items to their cart, but then did nothing for at least 60 minutes, and never completed their purchase. We know if they are still putting thing into or taking things out of their shopping cart. The main changes you'll see are in Contacts. We've added a new Property Group called HubSync Information. All of these work just like any other HubSpot contact field. For the most part, these fields contain the information from the Last, most recent, order. Last Order ID - The shopping cart order ID for the last order. Use this if you ever want to lookup the order in the cart or cross-reference orders. Cart Customer ID - The customer ID in the shopping cart. Again, it lets you cross-reference contacts. Last Order Date - Date of the last order. Last Order Subtotal - For the last order, the sub-total before taxes or shipping. 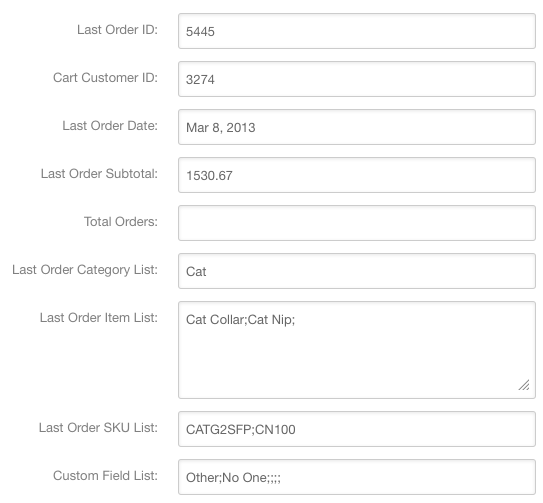 Total Orders - A field you can use to track the total number of orders for this contact. This requires setting up a workflow. I'll tell you how in another blog post. Last Order Category List - (Depends on your specific shopping cart.) Where available, we put the product category list from the last order. Categories are separated by semicolons (;). Last Order Items List - A list of the items from the last order separated by semicolons (;). Last Order SKU List - A list of the SKUs for each item in the last order separated by semicolons (;). Custom Field List - (Depends on your specific shopping cart.) Where available, we put a list of custom fields from the last order separated by semicolons (;). Besides this information, we also update other standard contact fields like name, address, city, state, company, etc. All of this is much cleaner for HubSpot 3 than with the old version of our software. Those of you who are more advanced in HubSpot 3 may already see ways to use this new information. I'm also going to show you some tricks in future blog articles. We also added new HubSpot 3 forms to support the new capabilities in HubSync3. The old version of HubSync used forms with names like "Completed Purchase." To keep things clearn, all the new conversion look like this: Completed Purchase (HubSync 3). Some of you may have the new Forms interface. Whether you do or not, it's very important that you not edit these forms or use them for anything other than HubSync. There are many factors that lead to the success of a business, such as social changes, financial status, availability of resources and so forth. But the most crucial thing that can affect your business is your personal perspective and attitude towards work. Passion is usually not in short supply with entrepreneurs; however, this doesn’t mean that all entrepreneurs have a passion for what’s needed. Many times, people have tremendous passion for their product, service or technology but this doesn’t necessarily translate into a passion for managing a company. Kindness is a wonderful trait and one that we need more in business today. However, a relentless need to please can be detrimental to an entrepreneur. People with this tendency often overextend themselves in the workplace and bend over backwards for others. In short, it’s hard to achieve your own goals when you’re constantly focused on trying to make everyone else in the room happy. When you run your own business, you call the shots. You’ll need to be confident making decisions on the fly and setting your own course without any instructions. If these aren’t your strengths right now, you’ll need to learn them pretty fast. If you’re scared of failing, you’re probably playing it too safe as an entrepreneur. Fear of failure is one of the strongest forces holding people back from their potential. If you fall into this category, you’ve learned that it’s easier to slide along with the status quo than to take that important first step. With all of today’s digital distractions, it’s easier than ever to lose control of one’s schedule and goals. Savvy entrepreneurs know how to stay focused on their priorities in the face of these distractions. They understand how to manage and lead their time, rather than simply react to issues and requests as they come in. To learn what not to do, I encourage you to read the full article, 7 Reasons Some Entrepreneurs Don't Meet Their Potential. Your business’ success depends on how you, as an entrepreneur, perceive it. There’s an old adage that says, “Love your job so you don’t have to work for the rest of your life”. If you have enough belief and passion for what you do, success can come your way. Be unrelenting in your efforts concerning your business, in order to rise to the occasion. What about you? Do you have some of these traits too? What did you do about it? Leave a comment and share it to us! Marketing is also like any game - you plan the best strategies, execute them the best way you can and keep your goal focused on success. For you to win in any game, you should know your opponents and learn their strengths and weaknesses - as much as you know your own capabilities and liabilities. It’s the same way with marketing. Scott Batchelor, a manager of field marketing at SAS, came up with an interesting analogy comparing marketing with the World Series. He believes that when you test, measure and adjust your marketing campaigns to respond to a constantly changing environment, you can confidently make the changes needed to increase effectiveness. Scott devised three marketing tips inspired by the fall classic. Build a heat map of your marketing campaigns to analyze where you're hot and where you're not. Focus on the hot! A marketing heat map can help analyze the success of campaign ingredients. Start by listing all the different activities in your marketing lineup, and then establish the criteria for three categories: hot, warm, and cold. Building these criteria, (this can change from industry to industry and category to category), will give you the opportunity to tailor your definition of success. Don't be predictable. Mix up your campaigns to stay fresh and interesting. Think of your audience as you construct a marketing campaign. Build toward the end goal—a registration, a click through or a personal contact. Instead of starting from scratch each time you plan something, use one campaign to build on the next. If you zig when they think you'll zag, you'll gain their attention - and you'll be more effective. Use historical campaign data along with your gut instinct to make decisions. You'll have a lot less indigestion when you use data to back your gut. Marketers tend to create campaigns that are inspired by other campaigns. 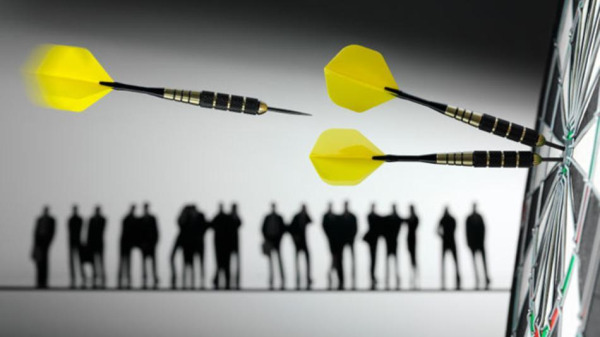 But determining how effective those new campaigns will be is sometimes akin to throwing darts at a dartboard. We just don't know what the click-through rate, conversion percentage, or registration numbers will be. Sometimes we have to go with our gut because we feel it's the right thing to do. Use these tips to make your marketing campaigns better for your company. As with this article, it’s a good idea to take ideas from all different areas of “real life”. The savvy entrepreneur will look at various elements of society, entertainment and other events in their world – and see how they could apply to their business. When you test, measure and adjust your marketing campaigns to respond to a constantly changing environment, you can confidently make the changes needed to increase effectiveness. With the rapid change in technology and the social changes it brings, there can be an uncertainty to the stability of your business. After all, big changes are hard to keep up with, especially when you don’t have a business strategy. To be successful, you sometimes have to take risks in new technologies or mediums. After all, as an entrepreneur, sometimes we’re called upon to take calculated risks in order to take your business to the next level. Social Media. Both the young and old are connecting and engaging in social networking. 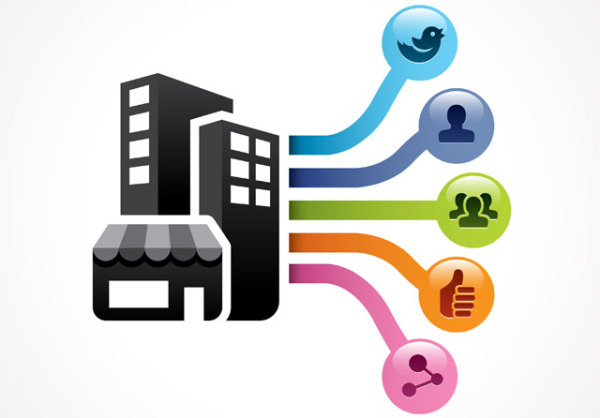 Everyone wants to be part of a community, so the best place for your business to be, is in relevant social media websites. Social media can help your business in so many ways, such as making your business more sharable and accessible to your audience and business prospects. It also promotes brand awareness, and can help you build a stronger relationship with your loyal customers and potential clients. It can also be a platform for you to interact and engage with people from communities and forums to gather feedback and suggestions that could help improve the quality of your products and services. Social media can also be a great platform to educate people about your brand, how you fir into their world and help them make smart buying decisions. Content Marketing. Content is essential for your business to grow online. Through helpful and informative content, you can drive traffic to your website, generate leads and earn profits. The content you publish in your company’s site and blogs can help determine your success. Your content reflects your business, so keep in mind to always keep your information relevant, educating, resourceful and even entertaining. One important goal is to engage your audience and captivate their attention through your content. Mobile. Most all of us indulge in the benefits that mobile devices bring in our lives every day. Because mobile devises have changed the way we send and receive communication, it would be wise for your business to invest in mobile website technology. By having a mobile site, you will reach a much broader audience, and your prospects will be able to easily access your business anytime - and anywhere - with just push of a button. To find out more about the benefits of these marketing investments for your business, I recommend reading, “3 Must-Have Marketing Investments”, a very helpful article from Mashable. Share your thoughts with us, by leaving your comments and questions. Technology changes faster than most anyone can keep up with. As a business owner or marketing professional, it’s your job to adapt and move as the market demands. If you don’t keep up with the ever-changing technological and social demands of your customers – your competition will. I had a client today ask me about the best practices for forms on landing pages. Well, the most direct path is not always the easiest or the best! It's nearly always best to use the shortest possible form — Name, Email, and perhaps Phone Number. Then, clients say: "Yes, but we need to know what zip code they are in to assign them to a salesperson." Or, "Yes, but we need to know their technical requirements." You can still get all that information. Just don't kill your conversion rates by asking for it all at once. It's like trying to climb a mountain. You could try to go straight up. That would be the most direct path — Unless you ran into a steep cliff and fell off! 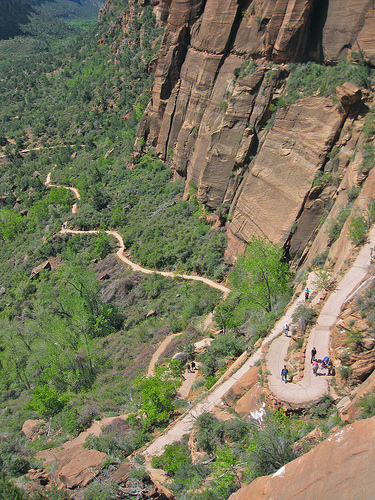 Or, you could climb up using switchbacks to zig-zag your way. Less direct, but much more likely to get you to the top. Use the simplest possible form for the first conversion. 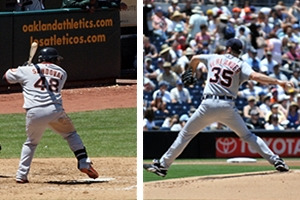 Get the prospect's name and email address. Send them an email with a link to a valuable piece of content. In the email and in your content, have a call-to-action that encourages them to take the next step. The next step link goes to another form that requires they enter a bit more information, but also promises more value. Then, send another email that delivers the value and has another call-to-action. When you have a valuable product that solves a problem for your prospects, they'll gladly take the next step. If you don't have a valuable product, stop spending money on marketing and invest instead in making your product better! Plus, this way, you have their name and email. You can keep checking with them until you find a fit or determine there isn't a fit. If you ask for too much information up front, they may never give you anything, and there's nothing you can do. There's yet another advantage. Have you ever entered bogus information on a web form? I know I have. When you ask for too much, too soon, you encourage people to lie. But, that's not the end of the story. People at your company will assume the bogus data is valid and assign the new hot lead to a busy salesperson. The salesperson ends up wasting time chasing down a High School student who's just trying to write a term paper! It helps if you have the right marketing platform to make the multi-step process easier to implement. Contact Me, if you want to know more. Please leave a comment if you use multi-step forms. What have you found that works? Every day, millions of people surf online to search, research and purchase products and services that fit their wants and needs. Because of this, savvy business owners and online marketers make it a priority to continuously improve the quality of service they can offer to their consumers. To stay competitive, it is vital for online marketers to adapt to the changes and enhancements of the tools and features they use in their marketing strategies. HubSpot is well-known for helping business owners and online marketers provide their customers and clients with an excellent service they truly deserve. As an advocate of marketing, they have constantly developed tools and strategies that help online marketers and their prospects have the best marketing experience possible. Recently, HubSpot enhanced their list segmentation tool. In addition to building segments from form submissions, list memberships and properties, it is now easy to set page views and events as criteria. This feature makes it possible to build a list, trigger an email or internal notification, start a workflow, trigger a web hook, or serve Smart CTAs to contacts that have completed a specific event or viewed a specific page. To find out more about the timeline segmentation, check out the article, “Timeline Segmentation: A New Way to Segment Your Database with HubSpot Enterprise” by Jeffrey Russo. Use HubSpot’s timeline segmentation tool to build segments off of form submissions, list memberships, and properties, and easily set page views and events as criteria to convey more relevant purposeful messages. Since the announcement of the all new HubSpot 3 in late August, there has been a lot of buzz about the enhancements of this marketing tool. If you’re looking to increase your online leads and sales, you’ll be excited for what HubSpot 3 has to offer your company. HubSpot 3 is the next phase of HubSpot marketing software, and makes the difficult easy, and the impossible possible. It's the only marketing system you'll ever want or need. With this new enhancement, HubSpot continues in their mission to help businesses grow and give marketers a better marketing experience more than ever. It’s very common today for a business to use FIVE to TEN tools to manage their online marketing - just to communicate with their prospects and customers. Even with these disjoined tools, most companies aren’t getting any closer to the kind of relevant and personalized communication leads and customers need. So now, there is another opportunity, a chance to help business owners and marketing professionals in companies of every size and industry reduce the noise that has made marketing increasingly more fragmented, and get back to the strategy and art that marketing professionals can truly appreciate. Contacts Database with Dynamic Lists: The completely rebuilt contacts database (prospects, leads, customers) is really the brain of the new platform, and provides a 360 degree view into your leads and customers. Social Segmentation: For each social share in HubSpot, you can see which of your leads and customers clicked on it and then add those contacts to a social media segment and follow-up with an email or smart CTA on a similar topic. You can also pull a smart list of all of your contacts with a large social following and a history of clicking on your lists. Landing Pages with A/B Testing: Landing pages have been rebuilt to be closely integrated with the Contacts database, CRM systems, email, dynamic components and social media. Using the new landing pages marketers can build, implement and measure a full campaign in one place. Intelligent Email System: The email system is closely integrated with the contacts database, workflows social media, smart content and landing pages. It includes hand crafted templates that have been tested across browsers and platforms, personalization using any detail from the contact database and robust analytics. Workflows: They leverage the enormous amount of data in the Contacts database and a series of rules (triggers) set by the marketer to create dynamically evolving segments and automate marketing actions. The best part of all is that HubSpot 3 is now mobile and available for you on the go. HubSpot 3 has released their first ever mobile app so you can manage those leads even when you’re not in front of your computer. This is just the beginning of the many attributes HubSpot 3 has to offer. As a leader in the marketing profession, HubSpot 3 will continue to develop and improve tools that help their customers become more efficient, while helping their business grows. Online marketing doesn’t end with just creating a website alone. You have to exert all kinds of effort to make your website well known and established online. Every day new technologies are being developed and it’s important that as a business owner, CEO or the person responsible for your company’s marketing, you keep up with the advances and changes. It’s not enough just to build a website that publishes resourceful content. You really have to distribute your helpful content in places where your prospects are located. The key to this strategy is getting found online where your prospects might be searching. Your potential customers or clients should be able to easily find you because of the placement of your content. But how do you establish a better online presence? Let’s start with a well-designed and better developed website. Appearance is not everything, but it can be a great contribution to set the professional “tone” for prospects. Your functionally, well-designed website needs to be appealing to keep your visitors interested, engaged, and wanting to come back again for more! 1) Know how you want your business to be known Is your brand recognizable? You should know what your prospective customers or clients want in order for them to choose you among the variety of competitors in your marketplace. It is important that they clearly see your business as the only answer to their needs and wants. Better branding will make your business more identifiable than your competitors in the market, and makes it much easier for them to find and recognize you online. 2) Publish great quality content with targeted keywords and phrases Always keep in mind that the excessive use of keywords is a detriment to you by search engines like Google, Yahoo!, Bing and others. Be sure that you incorporate your keywords and phrases sensibly without compromising the quality of your content. This will also help improve your search engine (SEO) ranking. A high search engine ranking will certainly improve your chances for getting found online. 3) Drive traffic , generate leads and convert leads to sales Once you have an appealing, relevant and “sticky” website people can go to for their searching needs, website traffic will come (and stay)! The next step therefore is for you to turn these visitors into customers, and these customers into sales. To do this, make sure that your website has a “call to action” in order for your visitors to move to the next step. Your call to action should be relevant, specific and it must encourage them to respond. It’s also a good idea to reward them for responding. You could reward them with a free download of valuable information, access to a “private” area of your website or something else to thank them for taking action. Once they respond, you’ll likely have sales you never experienced before. When you begin a system of moving prospects smoothly through this process, you’re influencing your industry and beginning to capture a larger segment of the marketplace – for good! 4) Use social media to interact and engage with your audience More and more people are engaging in social communities like Facebook, LinkedIn, Pinterest and Twitter to research, find their needs and connect with other like-minded people. Because of this, social media communities are the best place to position your business while educating, informing and empowering prospects about your business. Become regularly involved in the social media networks where your prospects “hang out”, and take the time necessary to interact and become involved in their questions, comments and discussions. It’s a great way of advertising and presenting your business in a “soft sell” way, while making your products or services more accessible for your audience. It’s also a sure way of getting found online. Establishing a better online presence can be done by following tried and true steps that take time, effort and patience, but the fruit of your labor will surely be rewarding. An established online presence will position you above your competitors, and make your company a highly recognized and trusted brand that people will want to buy from and share with others.